Global Bitumen Emulsifiers Market Size was estimated over USD 109 million in 2016 and will exhibit growth by a CAGR of over 4% up to 2024. Bitumen emulsifiers market growth will be chiefly driven by the increasing road development and building construction activities around the world. The product is a surface-active agent used in asphalt emulsions to keep the asphalt in its fine droplet state by disallowing it to mix with other droplets. Asphalt emulsion is a mixture of fine droplets of asphalt and water and since the former is a petroleum product, it doesn’t mix with water. Due to its sticky nature, it also doesn’t easily disintegrate into fine droplets. Thus, bitumen emulsifiers are used so that the asphalt is dispersed in the aqueous phase in the form of discrete particles which remain in suspension due to the electrostatic charges imparted to the asphalt particles by the emulsifier. The extensive use of bitumen emulsions in road construction and maintenance activities will augment the product demand during the forecast timeframe. Road development activities has been increasing at a fast pace, mostly in the developing countries of Asia Pacific and Latin America. Road development activities in China have been growing at a fast pace since the last three decades and the industry generated revenue above USD 350 billion in 2016. The total road length in the country increased from 3.7 million kilometers to 4.7 million kilometers from 2008 to 2016. During the same period, the total length of highways in China also increased from 60,300 kilometers to 131,000 kilometers. Road construction activities in India has also picked up pace since the last two decades with the Indian Government earmarking investments of around USD 20 billion for road construction projects during the 2012 to 2017 five-year plan. These upward trends in road development activities in Asia Pacific will boost asphalt emulsion’s demand which will in turn augment the bitumen emulsifiers market growth during the forecast timeframe. The product also finds its usage in building construction activities for water proofing and roofing applications. The global construction industry growth rate steadied at around 2.4% in 2016 and the rise in the amount of construction activities around the world will boost bitumen emulsifiers demand in coming years. In 2016, the North American construction industry output, valued at around USD 1.6 trillion, grew by almost 2%. During the same period Eastern and Western European construction industry output also grew by around 2.5%. In 2016, highest growth in construction output, more than 3%, was recorded in Asia Pacific and Middle East & Africa. These positive trends in the global construction industry will contribute towards the bitumen emulsifiers market growth in coming years. The global bitumen emulsifiers market has been segmented into three product types including anionic, cationic, and non-ionic. Cationic emulsifiers is the major product type accounting for more than two-thirds of the overall market in 2016 and the segment is likely to grow with a CAGR above 4% till 2024. Compatibility of cationic bitumen emulsifiers with a wide range of aggregates, its better adhesion properties and its usability in a variety of weather conditions will drive this segments industry growth in coming years. Anionic bitumen emulsifiers product segment is likely to grow by a CAGR of more than 3% during the forecast timeframe and generated a revenue above USD 17 million in 2016. Although, this product type has been in use since the introduction of asphalt emulsions, they are slowly losing popularity in recent years due to the better performance of cationic types. However, many new anionic emulsifiers available in the market which have been tailor made for use in bitumen will augment its industry growth in coming years. According to setting types, the bitumen emulsifiers market has been segmented into rapid, medium, and slow types. The rapid setting emulsifiers segment market value was more than USD 45 million in 2016 and the segment is likely to grow with a CAGR of around 4.5% during the forecast timeframe. Some of the commonly used rapid setting bitumen emulsifiers are diamines and quaternary amines. The segment’s market will be chiefly augmented by the product’s usage in a range of spray applications of asphalt emulsions. Medium setting bitumen emulsifiers segment accounted for more than 15% of the overall industry share and their market is likely to gain by a CAGR above 3.5%. Tall oil fatty acids and tallow diamines are commonly used medium setting emulsifiers. Their usage in a wide range of asphalt spray as well as mixing applications will contribute to their industry growth till 2024. 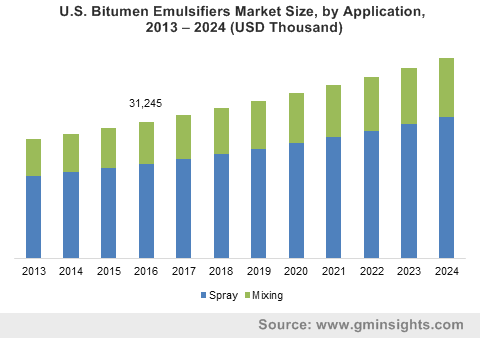 The global bitumen emulsifiers market has been bifurcated into spray and mixing applications. Spray application represents a significant amount of the product demand and is further segmented into surface dressing, tack coat, prime coat, and other minor spray applications such as penetration macadam, and fog seal. Among these, surface dressing application sub-segment has the highest market value of above USD 40 million. Surface dressing provides many benefits including a low-cost preventive measure for waterproofing and sealing small cracks, enriching hardened asphalt, and protecting underlying pavement from oxidation and aging. These factors will boost its demand in coming years. Mixing applications segment is likely to gain by more than 3.5% CAGR during the forecast timeframe. This segment has been further segmented into cold mix, grave emulsions, slurry seal & micro surfacing, and other mixing applications such as soil stabilization, recycling, etc. Cold mix is a key mixing application sub-segment which is likely to grow with a CAGR of above 3% till 2024. The lower environmental impact, better energy efficiency, and ease of use of cold mix applications will augment their market growth during the forecast timeframe. Bitumen emulsifier market has been segmented according to end-use applications into polymer modified and unmodified bitumen emulsifiers. Unmodified bitumen accounted for the majority of the market in 2016 and is likely to hold sway during the forecast timeframe. Their easy manufacturing process, availability, and low cost are the chief reasons behind its increased usage, mostly in the developing regions. This segment is likely to gain by more than 4% CAGR till 2024. Polymer modified bitumen end-use segment market value was above USD 18 million in 2016. This segment will witness a healthy growth rate during the forecast timeframe owing to their higher strength and elasticity when compared with the unmodified type. Europe accounted for a significant share of the global bitumen emulsifiers market and the regional market will be chiefly led by France, followed by Spain, UK, and Germany. The European market will be augmented by the rising asphalt emulsion demand for road construction and maintenance activities. Rapid construction activities in the Eastern and Western European countries will also contribute to the product market growth. The European market was valued at more than USD 25 million in 2016. Asia Pacific is also a key region for the bitumen emulsifiers market with a growth rate exceeding 3.5% CAGR. Rising automotive demand in the region coupled with a growing need to connect the entire Asia Pacific region through a network of high speed roads will augment the product industry growth. Increasing disposable income and rising urban population will lead to higher demand for residential buildings which will in turn boost bitumen emulsifiers demand in coming years. 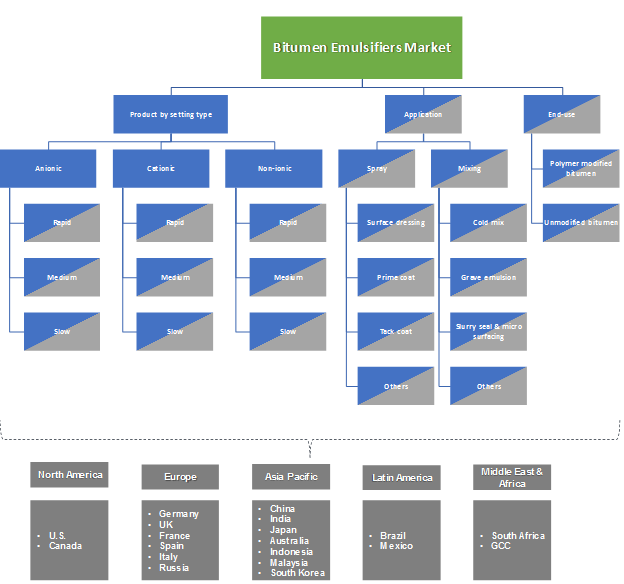 The key players in the global bitumen emulsifiers market includes AkzoNobel N.V., Arkema Group, Opal Paints Products Pvt Ltd., Industrial Oleochemical Products, Petrochem Specialties, Kao Corporation, Ingevity Corporation, The Dow Chemical Company, Evonik, Chemoran, RX Marine International, Pinova Inc., Shaoxing Shangyu Simo Research Institute of Organic Chemistry, Vizag Chemicals, and G R Infraprojects Ltd. Industry participants are trying to enhance their competitiveness and improve their industry presence through capacity expansions as well as mergers & acquisitions. The bitumen emulsifier industry growth is concurrent with the growth of asphalt emulsion usage. Asphalt emulsions are used in construction of roads and buildings due to their superior binding properties. The steady growth in the global construction industry coupled with rising paving activities in many parts of the world will be the major growth enabler for the industry. The advantages of the product over normal bitumen along with its usage in soil stabilization activities in arid regions will augment the bitumen emulsifiers market growth.